Christmas and dad's birthday!!! Aren't they enough reasons to bake a yummylicious cake :) :) Yessss!! Indeed it was. 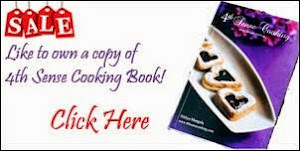 Sieve all purpose flour, salt, baking powder and baking soda together and keep it aside. Powder the clove, cardamom and Cinnamon together. Melt butter and beat in the powdered sugar until it becomes fluffy. Now add the spice powder and vanilla essence to it and beat it until it mixes evenly. Peel the skin of the apple and grate it. Add the grated apple and tutti frutti to the batter and beat it for just a min. Now add the flour mixture and mix until it gets incorporated and forms a thick batter. Line a cake tin with parchment paper and grease it. Pour in the batter into the mould and bake in 180°C for 50-60 mins. Remove from oven and allow the cake to cool on wire rack for a while. Invert and decorate according to your wish. This quantity makes a 1/2 kg square cake. 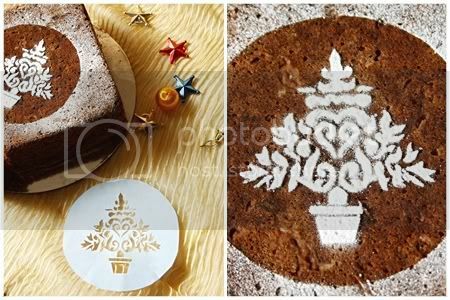 You can simply place a stencil on top of the cake and sprinkle icing sugar and remove the stencil back carefully. You can use silver sugar balls to decorate too. Top with some icing cream. Grate the apples and use them. Do not grind it. Grate it just when you are going to mix it into the batter. Doing it earlier might turn the apple brown. 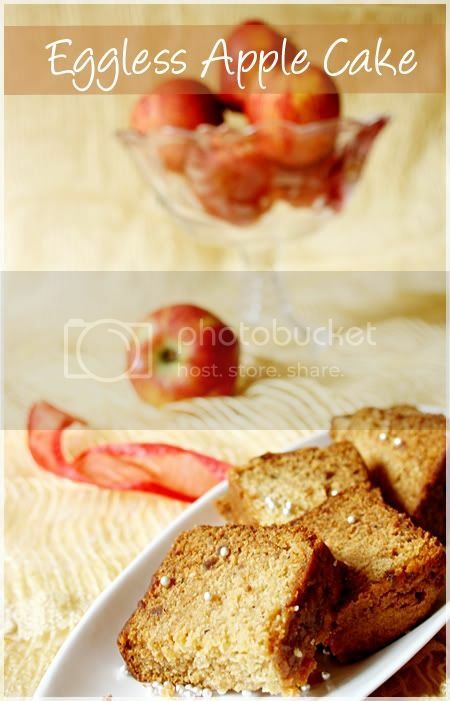 You can use other fruits like cherries and dates too. Add finely chopped cashews, almonds, pistachios etc to make it rich. Eggless and so fluffy...wow! And pass on my wishes to ur dad too...am sure this must be the greatest gift to him. 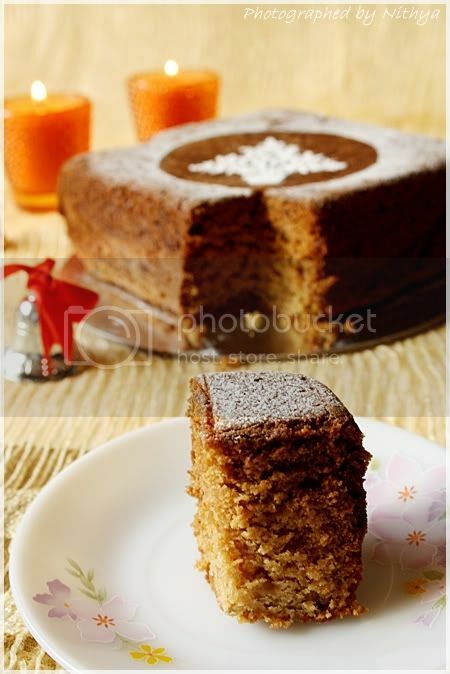 I luv the texture of the cake and the fact that it has less butter :) Bookmarked to try! Cake looks delicious, convey my wishes to your dad. birthday wishes to your Dad! cake looks amazing and that stencil is simply stunning. Hapy birthday to ur Dad..Lovely presentation and the cake is moist and I love every single slice Nits.. This is the best home made cake I ve ever tasted. Soooo simple to make and sooo tasty! Hats off nithi! Merry Christmas!!! 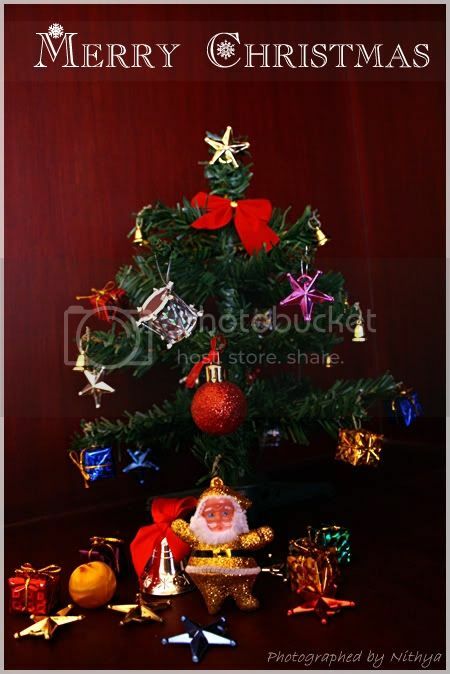 Merry Christmas to you and ur family...convey my wishes to ur dad. I am sure ur dad will be sooo proud and happy to see your amazing presentation and delicious cake. Cake looks excellent, super delicious and cute..My birthday wishes to ur dad Nithya..
Nithya, cake looks fabulous with the sugar dusting on top! Wishes to your dad and merry christmas!! Happy birthday to your dear Dad (I thought you kept a secret from us. )..Merry Christmas to you! 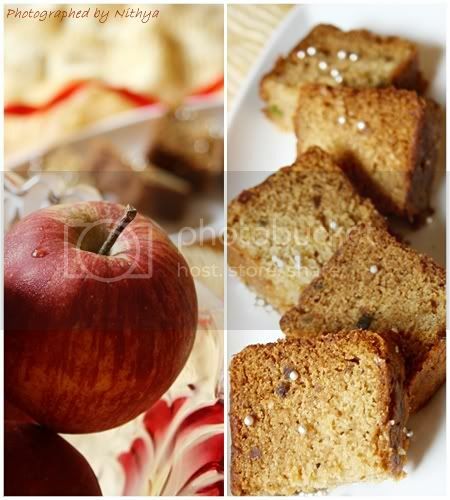 I am drooling what a delicious and yummy apple cake. 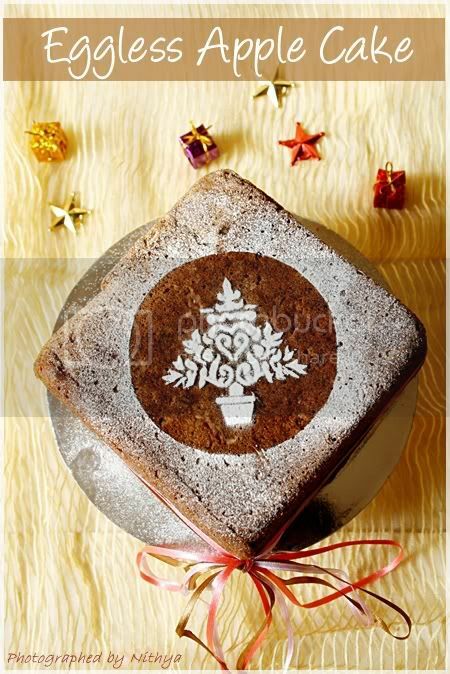 Merry Christmas,apple cake looks mouthwatering. Birthday Wishes to your Pa. Cake looks perfect and awesome. Merry Christmas. needless to say.. the presentation and cake looks yummy!!!!!! Cake looks gorgeous...Loved the use of stencil...Thought u must have hand made the stencil and it turned out to be so..
Sooooooooooooooooooooo WOW!!!! I loved d clicks Nithya! Wana try this! Hi Nithi the cake looks gorgeous .. Hey did not realise Mamiya b'day :( Belated wishes to him. And u gave wonderful treat right :) Hope u all had a blast. Nithi I am using 18-55mm lens. U'r creativity has no bounds Girl! !Merry christmas and happy holidays!! awesome cake Nithya!! My wishes to your dad..and Merry Christmas to u & ur family!! 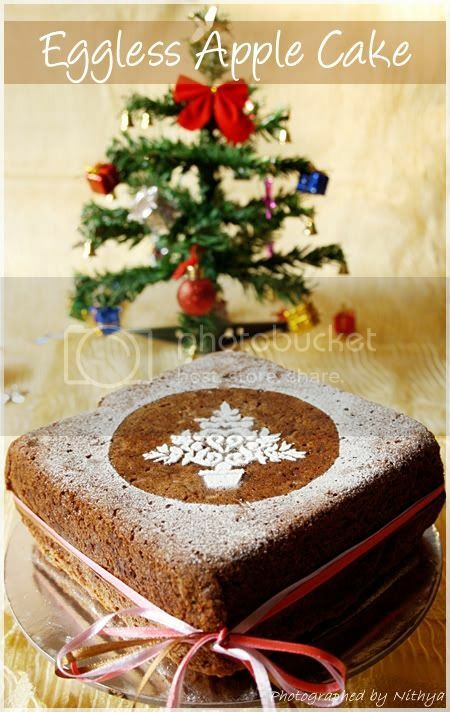 wow..cake looks yummy...lovely pics too...Nitya wishing you a merry Christmas.. The stencil work looks great. Many Many Happy Returns Of the Day to your Dad!! Bookmarked the cake, i love the texture and flavors! Looks gorgeous and a perfect way to celebrate!! Beautiful and yummylicious Apple Cake..Birthday wishes to ur dad..I'm sure he must have been so happy. Pretty impressed with the stencilling too..Its awesome. I've got to try that on one of my cakes too..not going to make the stencil though..that I leave it to the Pro like YOU.. Merry Christmas and happy new year to u and ur family. Cake looks really yummy..that to eggles wow. B'day wish to your Dad. Here too late... happy gaya wala birthday to your father. The cake looks delicious Nithya. You have become a perfect cook now... Wana prize?